Estonia had to work really hard at the Port Vila Stadium for a 1-0 win over Vanuatu on Thursday. Bosnian club FK Sarajevo’s attacking midfielder, Frank Liivak got hold of a rebound inside the penalty box slotting it into an empty net in the first half to give his side the lead. The goal proved enough for Estonia to claim its second win on their tour of Oceania after beating Fiji 2-0 on Sunday. It wasn’t a one-sided affair in Vanuatu’s capital with the local side dominant throughout the match with Alex Saniel and John Alick creating havoc in the midfield and producing attacking options for Vanuatu. 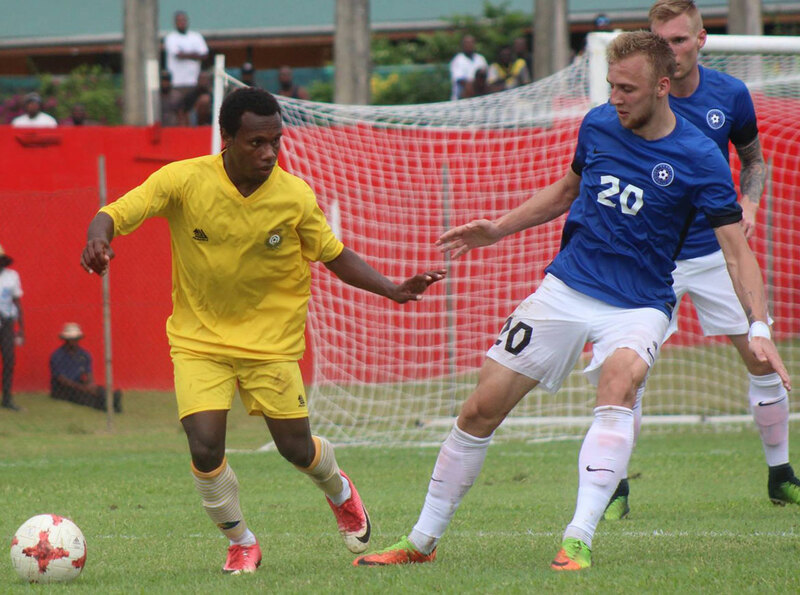 However finishing in the final third proved tough for Vanuatu as strikers Tony Kaltak and Elkington Moli just could not get the ball into the net. Vanuatu’s Europe-based midfielder Bong Kalo did well for the side, his first outing since returning from Switzerland’s FC Ascona. The diminutive but wily Kalo stood shoulder-to-shoulder with the Estonian defense, and had three of his free kick fly just inches shy of the cross bar. Estonia were at times made to chase the ball around, and found themselves having to defend deep into their own half. Tony Kaltak came close to equalising for Vanuatu, only to have his effort thwarted by the keeper. The stature of the Estonian players compare to the average Vanuatu players made it difficult for the Estonian side when it came to defending and attacking, as the Estonians were taller and bulkier compare to the short and lean Vanuatu players. “The boys played a good game in front of the home crowd, despite going down a goal to a team of professionals, I am happy with the match and looking forward next month and doing well at the Pacific Mini Games,” team manager, Peter Takaro said. Estonia’s final match in Oceania will see them play New Caledonia this Sunday from 5pm at Numa Daly Stadium.